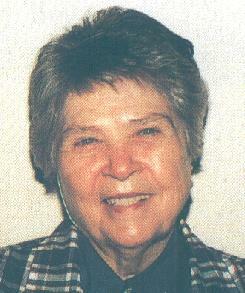 Lorraine M. Golden, D.C., a native of Bowling Green, Kentucky, had a private practice in Louisville from 1942-1957. Dr. Golden was a graduate of Palmer School of Chiropractic Clinic, and pursued special study in the field of spinography under Dr. J. F. Grostic at Ann Arbor, Michigan. During Dr. Golden's attendance at Palmer School, her colleagues chose for her the motto, "True to her word and true to her friends." She always believed in and practiced the "Golden Rule" and was nationally known for her many deeds of philanthropy. She was the Founder and Executive Administrator of Kentuckianas Center for Education, Health and Research, Inc., better known as Kentuckiana Children's Center. The Center provides educational and rehabilitative services, free of charge, to children with special needs, most of whom are from low/moderate income families. It was through Dr. Golden's efforts that the Health, Education and Welfare Department, Division of Surplus Property, in 1961, deeded to The Center 11.23 acres of land and six buildings for the purpose of expanding Kentuckiana's educational, health and research services. This was the federal government's first grant to an organization rendering chiropractic services. Through Dr. Golden's leadership, The Center grew into a facility which operates five days a week. In addition to chiropractic care, these services have expanded to include psychological and social evaluations and counseling, optometric and visual training, dietary analysis, and special education classes for special needs children. Medical and dental referrals are made as needed. About 350 children per year were served by The Center. Dr. Golden devoted endless hours and made untold sacrifices to bring this dream into reality . . . the mark of a great and unselfish humanitarian. In the process, she was able to catalyze community-based support and cooperation from labor unions and management, businesses, religious groups, civic organizations, Doctors of Chiropractic and their associations and auxiliaries, and private individuals nation-wide, in addition to The Center's own auxiliary. An accomplished speaker, Dr. Golden traveled extensively and addressed numerous groups to tell about Kentuckiana Children's Center, and "her" special needs children. Dr. Golden retired as Executive Administrator in May, 1998 after 41 years of devoted service. Dr. Golden's many honors include awards for outstanding services rendered to children, awards from the International Chiropractors Association for outstanding contributions to her profession, certificates of recognition for "meritorious service to humanity" presented by the American Chiropractic Association, and for "devoted effort toward the advancement of education in Jefferson County." Dr. Golden served on the membership committee of the Louisville Area Chamber of Commerce, and was an honorary member of Sigma Phi Chi and Inega Sigma Sororities. 1954 Kentucky Chiropractor of the Year, Dr. Golden was the first recipient of this prestigious award. Fellow of the International College of Chiropractors Dr. Golden was named in 1955 for outstanding work in her profession. Dr. Golden created and guided the nation-wide "Correct Posture Contest" which was designed to improve the general physical fitness of our nation's youth. Lifetime Member of the Board of Directors of the Third District of the Kentucky Association of Chiropractors, Dr. Golden was given this appointment in 1956. Kentucky Colonel. In 1958, she was commissioned in recognition of her many contributions to humanity through her profession. Doctor of Humanities Degree degree was given to Dr. Golden in 1962 by the Columbia Institute of Chiropractic in New York City. She also received a plaque for outstanding service by the Professional Women at Palmer College in Davenport, Iowa. A Distinguished Service Award from the Palmer College Alumni, a plaque for her outstanding contribution to humanity from the Indiana State Chiropractic Association, and an award for her outstanding interest and guidance in the development of the United Students Activity Committee at Logan College of Chiropractic in St. Louis, Missouri were all received in 1964. In 1967, Dr. Golden was honored by the Kentucky Federation of Business and Professional Women's Clubs as 1 of 10 Kentucky women who made outstanding contributions to the growth of the Commonwealth. At that time, she was presented an engraved silver bowl by Kentucky Governor Edward T. Breathitt on behalf of the Club. Community Services Award presented in 1972 by the Greater Louisville Central Labor Council. Dr. Golden received recognition for outstanding services for the betterment of humanity. She was the first woman to ever receive this award. The Distinguished Service Award was presented to Dr. Golden in 1980 by the New York Chiropractic College. Fellow No. 15 from approximately 34,000 candidates, Dr. Golden was selected to receive this Medallion from the New York College Academy of Chiropractic in 1984. Outstanding Kentuckian Awardwas given to Dr. Golden in 1984 by then Governor Martha Layne Collins, in recognition of "Outstanding Achievements and Meritorious Service to the Commonwealth of Kentucky." Dr. Mable Heath Palmer Award to the Foremost Woman Chiropractor of the Year. In August 1988, Dr. Golden received this distinguished honor. This beautiful plaque was presented by Dr. Agnes Palmer, IA, M.A., Hon., M.A., Sorority Supreme Kiatrus. Heart of Gold Award. In May, 1989, the International Chiropractors Association honored Dr. Golden with the first of these awards. This beautiful plaque was presented to her at their 63rd Annual Convention in St. Louis, in recognition of "her loving and caring service beyond the call of duty in an exemplary, humanitarian manner . . . witnessed by her voluntary help for crippled and special children, at no charge, over the last three+ decades." Giraffe. In August 1989, Dr. Golden was named by The Giraffe Project, in recognition of her "courage, compassion and commitment to the good of others" and for "sticking her neck out to create and sustain the Kentuckiana Children's Center." Doctor of Chiropractic Humanities was presented to Dr. Golden in 1990 by the Palmer College of Chiropractic. The Golden Award was given to Dr. Golden in 1993 by the Parker Chiropractic Resource Foundation, "in appreciation of over 50 years of dedication and loving service to the chiropractic profession and to humanity." Service Excellence Award was presented to The Kentuckiana Children's Center in 1994 by The Louisville Better Business Bureau. The Lee-Homewood Award was presented by the Association for Chiropractic History to Dr. Golden in February, 1998. Chiropractic Award of Excellence. In May, 1998, Dr. Golden was honored as national winner by the Alliance for Chiropractic Progress and Prevention Magazine. Chiropractor of the Year, Dr. Golden was named in 1998 by Dynamic Chiropractic. Lifetime Achievement Award. Dr. Golden was honored posthumously at the 1999 Chiropediatrics World Tour.  Sharon Vallone, D.C., D.I.I.C.P.